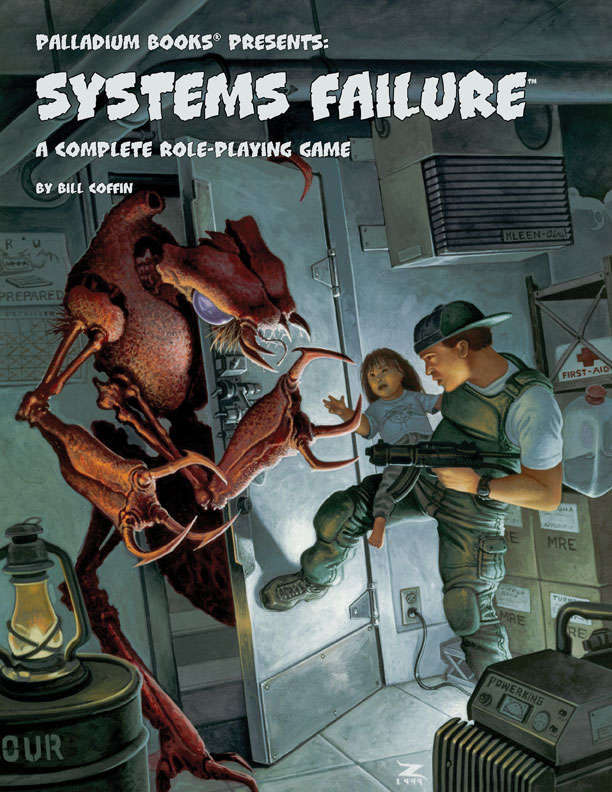 Systems Failure™ is non-stop, blood and guts action! A story of loss, rebirth, and courage. Of self-sacrifice, patriotism and heroics. Characters are of-color, off-kilter, and sometimes just plain crazy, but they are all heroes willing to take a stand. American civilization (and the world) has collapsed and is dominated by an inhuman foe from another world. It’s time she was free again. A truly different and tantalizing spin on the Post-Apocalyptic story setting, done with Palladium’s no-holds-barred, anything goes approach to things. A complete role-playing game with everything you need to play (other than people and dice) in one book. 11 O.C.C.s including the Exterminator, Freebooter, Sawbones, Grease Monkey, NORAD Psychic, NORAD Splicer, and Wacko. Creation rules and colorful background material to make each character unique. The monstrous enemy are bug-like alien invaders with the power to infiltrate and seize control of every electronic device on the planet. Plenty of maps, world information, and adventure ideas. Written by Bill Coffin with Kevin Siembieda.